In this post we will use fresh, organic, crispy beet greens rather than cooking it like a vegetable. Today we would blend beet greens with garbanzo beans. Garbanzo beans (like most legumes) have long been valued for their fiber content. Two cups provide the entire Daily Value! But the research news on garbanzos and fiber has recently taken us one step further by suggesting that the fiber benefits of garbanzo beans may go beyond the fiber benefits of other foods. In a recent study, two groups of participants received about 28 grams of fiber per day. But the two groups were very different in terms of their food sources for fiber. One group received dietary fiber primarily from garbanzo beans. The other group obtained dietary fiber from entirely different sources. The garbanzo bean group had better blood fat regulation, including lower levels of LDL-cholesterol, total cholesterol, and triglycerides. Here is one simple salad recipe that you can make in minutes! 1. 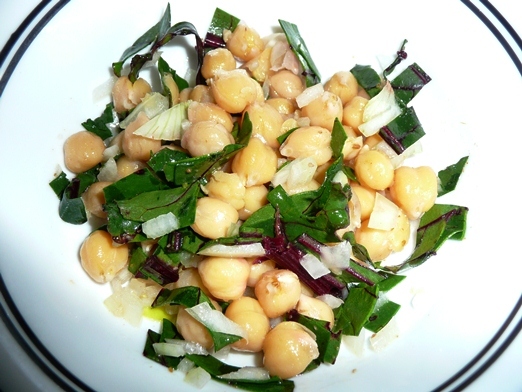 Mix beans, greens, finely chopped onions in a bowl. 2. Add salt and black pepper to taste. 3. Drizzle some EVOO – extra virgin olive oil. 3. Refrigerate for 10-15 mins.